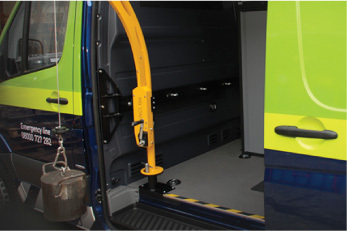 The Hope Tool Lift is designed to lift loads of up to 125kg easily, safely and accurately, whether loading or unloading, via the side door of leading panel vans. The unique features found within our Tool Lift ultimately help to protect your workers from injury and your vans from damage by facilitating smooth and simple operations that can be carefully controlled at every stage by one operator. With our advanced Tool Lift, loads of up to 125kg can be controlled and loaded or unloaded with ease and confidence through the side door of the majority of leading panel van makes and models. The Hope Tool Lift will help protect your van from damage during the loading and unloading of heavy cargo. Operations can be completed smoothly and simply with full control of the cargo possible even with a single worker or driver handling proceedings. 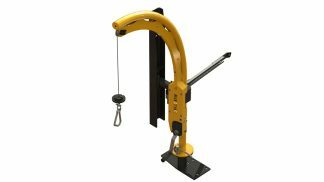 The Hope Tool Lift is a safe and simple way to protect and reduce the risk of injury to your operatives, your tools and van as you load and unload heavy equipment. Built in safety features include a lockable swing arm and automatic winch release brake to ensure that your cargo is protected at all times during transfers. The lift can be mounted in the side opening of Transit or Sprinter vans with minimal modifications, and takes up very little space when stored away. The Hope Tool Lift is installed using a base plate secured by bolts through the floor whilst the cross beam is secured using existing bulkhead mountings. The Tool Lift system is lightweight and will have minimal impact on the vehicle’s payload. The Hope Tool Lift helps you to comply with the latest Health and Safety regulations on manual handling and lifting, protecting your workforce in the field and protecting your company from liability claims. 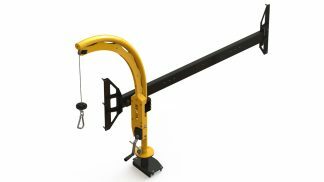 The Tool Lift uses a simple winding winch mechanism that can be operated by a solo delivery driver, allowing you to save money on manpower with every large load delivery. Features include a smooth running winch with spur gearing that provides high efficiency, and an integrated automatic load pressure brake to prevent the unintentional lowering of the load. The Hope Tool Lift is CE certified and built to last under the most demanding daily use. What’s more it’s powder coated to stay looking smart however hard it works. Our service doesn’t end with the purchase of your Tool Lift, we provide inspection, servicing, testing and examination to make sure that you can continue to reap the rewards of your investment long after you receive your product. The inspection offers a visual check of the condition of the Hope Tool Lift to identify any potential safety hazards. Users must also plan regular inspections of the Tool Lift based on its operational uses. Our service covers general maintenance, such as checking mechanical parts and fixings, carrying out necessary repairs or replacement of damaged or worn parts. If after being removed from one van, the Tool Lift is installed in another. The examination process determines the overall condition of the Hope Tool Lift and may incorporate all of the above. This examination includes an in-depth investigation of external and internal components. The results of the examination must be fully documented and kept available for inspection; should the examination uncover any dangerous defect in the equipment, it must not be used until the problem is rectified.